Hungering for a European sports sedan like an Audi A4, BMW 3 Series or Mercedes-Benz C-Class, but can't quite justify the expense? 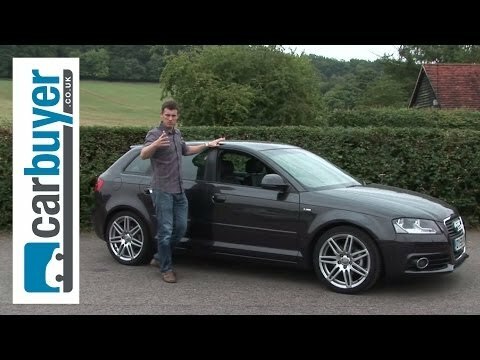 If so, the 2010 Audi A3's taut handling, sophisticated design and hatchback versatility, at a price lower than those worthy machines, could make this car a keeper. Every day review for the everyday driver. I really enjoy how smooth it drives, how great the gas mileage is and the over all design of the car. Its super stylish and has great interior design. The problem, or ok only issue I have with this car is that it does not have a modern radio or charging system. Other then that it doesn't look outdated. My vehicle is a TDI which gives it a nice a little pep. What I don't like is the delay is the gas pedal when accelerating. Over an ok car. Pretty good on gas mileage. I love my Audi and would choose the same exact vehicle if I had to choose again! Running smoothly, this spacious car is also quite the eye candy! VOLKSWAGEN IS RECALLING CERTAIN MODEL YEAR 2009 AND 2010 PASSENGER CARS MANUFACTURED BETWEEN SEPTEMBER 2008 AND AUGUST 2009. THE WIRING HARNESS OF A TEMPERATURE SENSOR IN THE DIRECT SHIFT GEARBOX (DSG) MAY HAVE CONNECTOR WIRES THAT WERE INSUFFICIENTLY CRIMPED. WITH INSUFFICIENTLY CRIMPED CONNECTOR WIRES, A TEMPERATURE SENSOR HAS THE POTENTIAL TO FALSELY DETECT A HIGH GEARBOX OIL TEMPERATURE, CAUSING THE TRANSMISSION TO ABRUPTLY SHIFT TO NEUTRAL. IF THIS HAPPENS, THE SELECTOR LEVER POSITION INDICATOR WITHIN THE INSTRUMENT PANEL WILL FLASH. IN ADDITION, THE "DEPRESS BRAKE PEDAL" INDICATOR LIGHT WILL BE ILLUMINATED, ALERTING THE DRIVER TO APPLY THE BRAKES. THE ABRUPT SHIFT TO NEUTRAL COULD LEAD TO A CRASH WITHOUT WARNING. VOLKSWAGEN WILL NOTIFY OWNERS, INSPECT THE DSG AND, IF NECESSARY, REPLACE AN AFFECTED DSG TEMPERATURE SENSOR FREE OF CHARGE. THE MANUFACTURER HAS NOT YET PROVIDED A NOTIFICATION SCHEDULE. OWNERS MAY CONTACT VOLKSWAGEN AT 1-800-822-8987. VOLKSWAGEN IS RECALLING CERTAIN MODEL YEAR 2006 THROUGH 2010 AUDI A3, TT, AND TT ROADSTER PASSENGER VEHICLES MANUFACTURED BETWEEN SEPTEMBER 29, 2005 AND AUGUST 26, 2009. THE CLOSING FORCE OF AN INTERNAL SPRING OF THE FUEL TANK VENTILATION VALVE IS NOT ADEQUATE ENOUGH TO HOLD THE VALVE CLOSED UNDER EXTREME DRIVING CONDITIONS POSSIBLY ALLOWING FUEL TO LEAK. IN THE PRESENCE OF AN IGNITION SOURCE, A VEHICLE FIRE COULD OCCUR. VOLKSWAGEN WILL NOTIFY OWNERS AND AUDI DEALERS WILL REPLACE THE FUEL TANK VENTILATION VALVE WITH AN IMPROVED VALVE FREE OF CHARGE. THE SAFETY RECALL IS EXPECTED TO BEGIN DURING OCTOBER 2009. OWNERS MAY CONTACT AUDI AT 1-800-253-2834. Volkswagen Group of America, Inc. (Volkswagen) is recalling certain model year 2006 Volkswagen Passat sedans and wagons, 2005-2013 Audi A3, and 2006-2009 Audi A4 Cabriolet vehicles. Upon deployment of the driver's frontal air bag, excessive internal pressure may cause the inflator to rupture. Volkswagen will notify owners, and dealers will replace the driver's frontal air bag inflators, free of charge. The manufacturer has not yet provided a notification schedule. Volkswagen owners may contact Volkswagen customer service at 1-800-893-5298. Audi owners may contact Audi customer service at 1-800-253-2834. VOLKSWAGEN IS RECALLING CERTAIN MODEL 2009-2012 JETTA AND JETTA SPORTWAGEN VEHICLES, MANUFACTURED FROM MAY 2008 THROUGH SEPTEMBER 2011, MODEL YEAR 2010-2012 VOLKSWAGEN GOLF VEHICLES, MANUFACTURED FROM MAY 2009 THROUGH SEPTEMBER 2011, AND MODEL YEAR 2010-2012 AUDI A3 VEHICLES, MANUFACTURED FROM SEPTEMBER 2009 THROUGH SEPTEMBER 2011, THAT ARE EQUIPPED WITH A 2.0L TDI COMMON RAIL DIESEL ENGINE/CLEAN DIESEL ENGINE. THE FUEL INJECTION PULSES COULD COINCIDE WITH THE NATURAL FREQUENCY OF THE INJECTOR LINE #2, IN SPECIFIC LOAD AND RPM CONDITIONS. THIS RESONANCE CREATES ADDITIONAL STRESS IN THE FUEL LINE. DUE TO THE RESONANCE CONDITION, INJECTOR LINE NUMBER 2 COULD DEVELOP SMALL CRACKS WHICH COULD LEAD TO FUEL LEAKAGE. LEAKING FUEL IN THE PRESENCE OF AN IGNITION SOURCE, MAY LEAD TO A FIRE. VOLKSWAGEN WILL INSTALL AN IMPROVED FUEL INJECTOR LINE FOR THE NUMBER 2 CYLINDER AND WILL INSTALL VIBRATION DAMPERS ON ALL OF THE INJECTOR LINES. VOLKSWAGEN AND AUDI WILL NOTIFY OWNERS TO HAVE THE VEHICLES REPAIRED FREE OF CHARGE. THE SAFETY RECALL IS EXPECTED TO BEGIN DURING NOVEMBER 2011. OWNERS MAY CONTACT VOLKSWAGEN AT 1-800-822-8987.